Can we create virtual storytellers that have enough expressive power to convey a story? 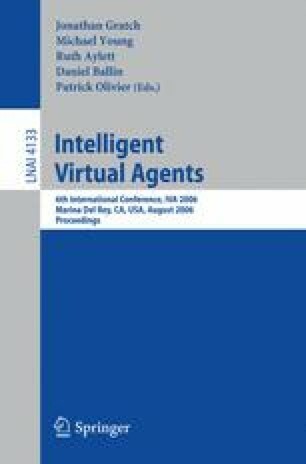 This paper presents a study comparing the storytelling ability between a virtual and a human storyteller. In order to evaluate it, three means of communication were taken into account: voice, facial expression and gestures. One hundred and eight students from computer engineering watched a video where a storyteller narrated the traditional Portuguese story entitled ”O Coelhinho Branco” (The little white rabbit). The students were divided into four groups. Each of these groups saw one video where the storyteller was portrayed either by a synthetic character or a human. The storyteller’s voice, no matter the nature of the character, could also be real or synthetic. After the video display, the participants filled a questionnaire where they rated the storyteller performance. For all dependent variables in Facial Expression, the synthesized version has a significant lower rating than the real one. Of particular interest is that the rating of this communication means is strongly affected not only by the visual expression but also by the voice. In fact, the use of synthesized voice has a significant negative effect when rating the facial expression. Regarding gestures, only one significant difference was found in the rating of its believability. In this case the synthetic storyteller presents worse performance than the human actor. In the remaining ratings the data suggests that the synthetic gestures have a close performance to the real ones. It is also worthy of notice that gestures rating have always a majority of positive ratings. Similarly to what happens in the facial expression, gestures also seem to be affected by the nature of the used voice, but this time in an inverse manner. Positive gestures ratings percentages have an increase or stay on the same value when the synthesized voice is taken into account. The voice was the medium that had a clearer significant difference between the real and the synthetic versions , having the real voice higher ratings than its counterpart. Nevertheless, only the satisfaction regarding the synthetic voice obtained a majority of negative ratings. Both the emotion and believability aspect of the synthetic voice gathered a majority of positive ratings.